"Hi Norman, I received the Jinhao Pearl Windows on Monday and it is all that you said it was in the recent Pen World article! Thank you. 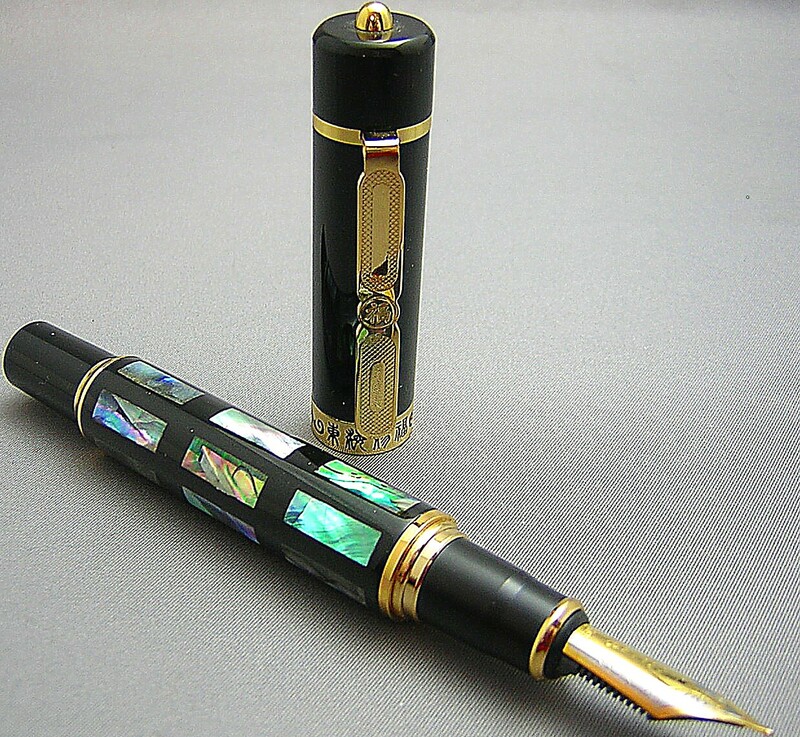 It is a very excellent pen." 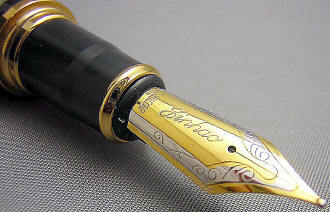 "Hallo Norman, the windows shocked me….it is very heavy (which I love), very wide and with a firm and steady writing. I am very happy with it and left all my other pens aside for the time being……I am impressed. If I knew i would have purchased the window panel too, guess i will very soon anyway. Thank you!" "I forgot to say in my last email a big thanks for your lovely handwritten origami letter, your visit card and the lovely pink seal, it made me feel like a princess. The pen is very beautiful (you have chosen lovely shades, thanks!) 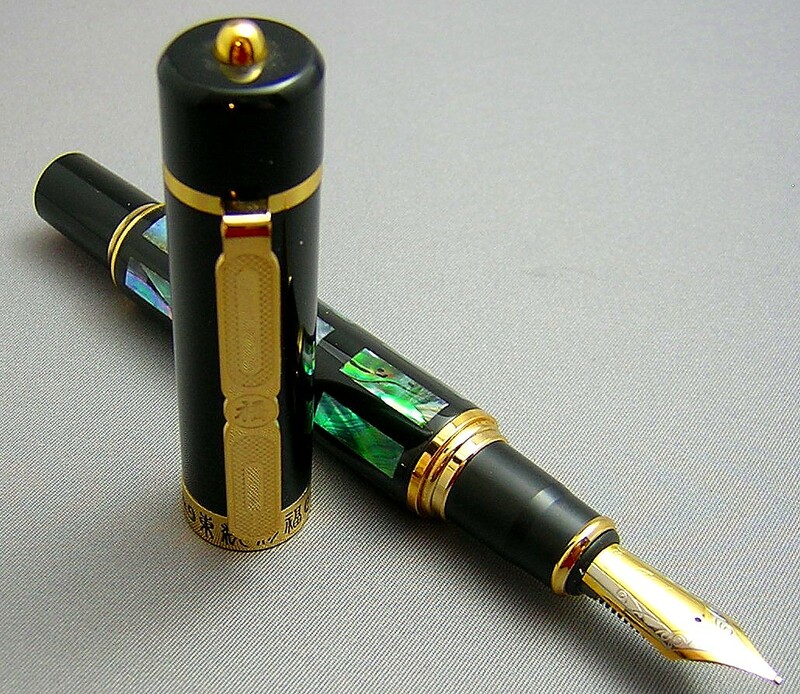 and I love the size and how smoothly it glides on the paper...I have filled it with a purple scented ink and it is lovely, I just miss that beautiful golden dot on the cap to finish it off in beauty. I personally think the dot made it looks million bucks, more beautiful than this 'western' style logo." 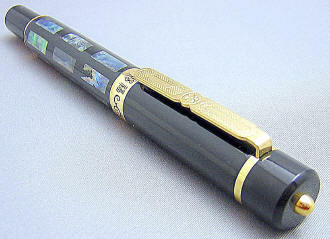 "Dear Norman, I received the Pearl Windows fountain pen. Yikes it lovely! It writes like a dream. 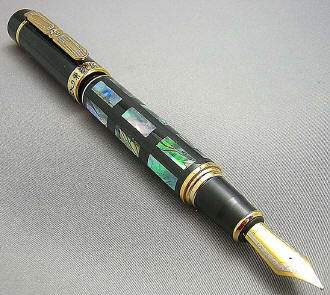 I’m using it for some extremely important healthful New Year journaling/processing. 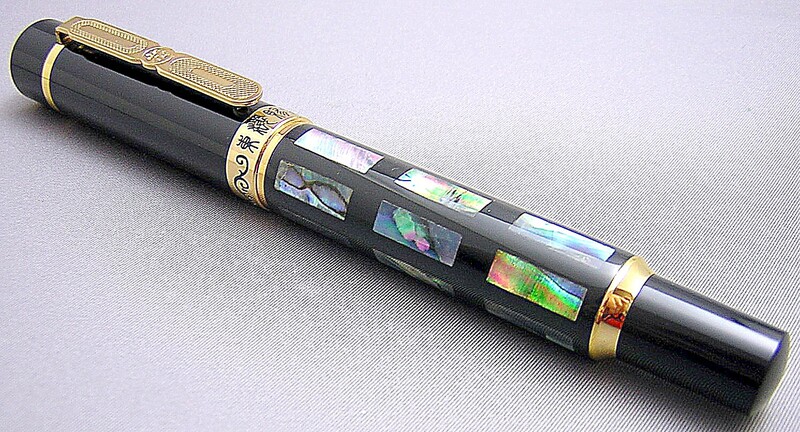 With purple ink. 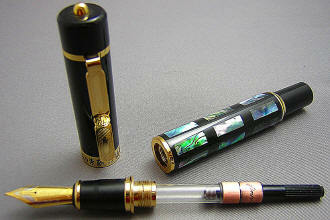 Thanks also for your gracious help in discerning the efficaciousness of my “hint” regarding this pen to my husband! It worked out perfectly!" 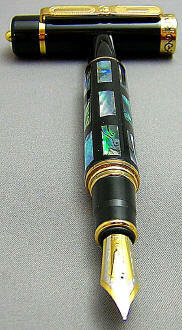 This oversized beauty measures 5-3/4" capped, 6-3/4" posted and 4-7/8" with cap held aside. 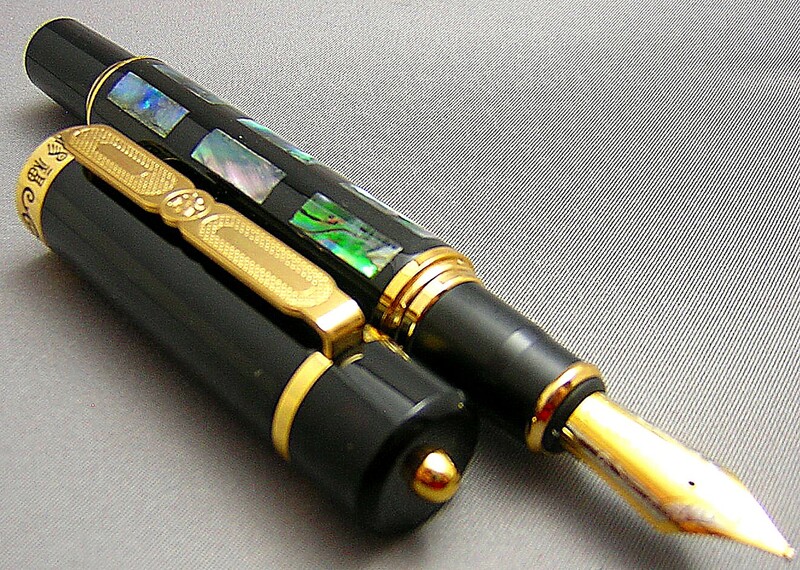 Due to its lacquer-over-brass construction -- and given its size -- this is a pen that you might want to write with unposted, although I find it remains quite balanced even with the cap affixed. 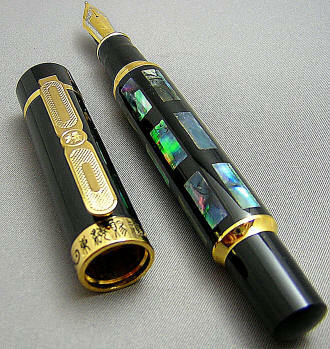 This is really a stunning pen. 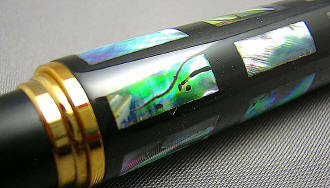 The Mother-of-Pearl inlays are of course all unique, so one pen will differ a great deal in appearance from another. Due to the grid pattern employed, it reminds me of a series of windows (there are eighteen panels or windows in all). The top of the cap evokes the pinnacle of many Chinese temples and adds a nice balance to the weight of the gold-plated clip and cap band. The center of the decorated clip displays the Chinese character for 'blessings', and the characters on the cap band roughly translate as 'blessings from the east' or 'orient'. Removing the slip cap (which re-positions with a satisfying 'click', or friction posts on the barrel end) displays the oversized, two-toned 18K gold-plated nib. 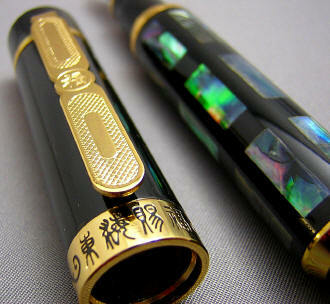 Along with scrollwork, the nib is engraved with 'Jinhao' and '18KGP'. I'd rate this as a true western medium.